UP Employment Exchange Registration 2019 Get Sarkari Naukari or Private jobs every month by joining UP employment exchange kanpur lucknow Registration.Simple step is you will have to visit sewayojan.up.nic.in Log in this website. In that page you will find section of sarkari naukari and private jobs tab.Now next month all students who have not got UP Laptop as per news from January all people recived who have registered form filled by previous year.UP Smartphone registration now over, samajwafi pension yojana for vridhavastha, Old age pension scheme, Kaushal Vikas Yojana, Pradhan Mantri Awas Yojana now running and UP Model career centre online counselling started from Lucknow. 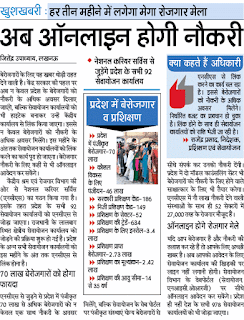 UP Rojgar Mela Date: Rojgar mela organize in Allahabad under salary 7,000-10,000 per month. Interested candidates must visit official website to apply online for rojgar mela. How To Get Employment Exchange Number: Central Employment exchange who take online registration for getting jobs may also get berojgari bhatta every month Rs 500.All kind of employment services, including vocational guidance, skill development programmes (kaushal Vikas)etc through the District Employment Offices. 1. Log Onto Employment Exchange through you register ID. 2. Select State and District from drop down menu. 3. Register your mobile number or email id. 5. You will get user id, password with registration Number and Date with Name of the Employment Exchange. 6. In UP, Employment exchange work in the form of berojgari bhatta and sewayojan. Benefits of Employment Exchange Online registration: Those who dont know about what is good in employment exchange. It is for Both govrment private employee,For 12th, graduate, B.tech, BCA, NBA diploma holder and exservice men. 1. When you go to job interview some roganization also aksed you for employment exchange number. 2. Employment exchange number also worked as aadhar card for identity process. 3. Daily SMS and Job alert you will recive on your mobile number and email. 4. If you have good qualification Job centre employee also call you to attend interview.